Hooray! What better way to celebrate the holiday than to see that Michele Berdy is back at the Moscow Times once again, feeding our hungry Russian loving souls once again! С Международным женским днён! Happy International Women’s Day! Over the years, I’ve kept a mental list of ways in which I have become Russified. Among these признаки обрусения (signs of Russification) are: I compulsively save plastic bags — вдруг пригодятся (they just might come in handy); I don’t throw things out — I move them to the dacha, where they will lie around for 10 years before I throw them out; and I loathe Международный женский день (International Women’s Day). My most miserable memories in Russia are standing with a smile frozen on my face as a male member of the коллектив (staff) thrust a bouquet of roses at me and spit out a patently insincere, totally improbable list of my supposed virtues. За самую красивую, умную, добрую, весёлую женщину на белом свете! (To the most beautiful, intelligent, kind and happy woman in the world!). For some reason, the more extravagant the praise, the more I felt just the opposite. The men would go home feeling virtuous, and I’d go home with wilting roses, melting chocolates, a champagne headache and the depressing conviction that I was, to the contrary, самая некрасивая, глупая, злая, и унылая женщина на белом свете (the most ugly, stupid, mean and cheerless woman in the world). The worst thing is that Americans are to blame for this holiday. It began on March 8, 1857, when women garment workers in New York went on strike to protest working conditions and low wages. 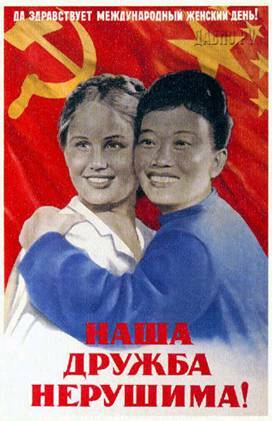 It was later declared International Women’s Day by a group of European women socialists and then brought to Soviet Russia. 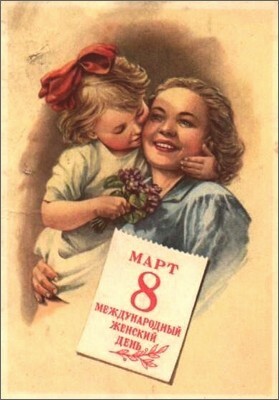 For decades in Russia, it was a combination of Mother’s Day and Valentine’s Day, with a bit of spring celebration thrown in. Today, it remains a day when men spend too much on flowers and try to come up with too clever speeches. Unfortunately, Runet has come to the rescue. Dozens of sites provide poems and toasts guaranteed to make men feel like knights — and make women feel like committing murder. Men, here’s what a woman will think: Lose the palm and take out the garbage instead. 1. Forget the chocolates (it’s March — everyone is on a diet). Buy her something she really wants, like a digital camera. And then — keep your promise. The women of Russia will thank you.